Obituary for Joseph A. Buttigieg | Kaniewski Funeral Homes, Inc.
With his family at his side, Joseph A. Buttigieg, 71, of South Bend, passed away peacefully on Sunday, January 27, 2019 at Memorial Hospital after an illness. Joseph was born in Hamrun, Malta on May 20, 1947, to Maria Concetta “Cettina” Portelli Buttigieg and Joseph Anthony Buttigieg. He is the eldest of eight siblings: Marcette Buttigieg of Pakur, Jharkhand State, India; Grace Buttigieg and Marika Buttigieg of Mosta, Malta; Franco Buttigieg and wife Nancy of Mellieha, Malta; John Buttigieg and wife Kay of St. Paul’s Bay, Malta; Myriam Buttigieg of Mosta; and Lucienne Buttigieg and partner Vanda Taylor of Haslemere, Surrey, England. He earned a Bachelors and Masters degree from the University of Malta, and a B.Phil from Heythrop College in Oxford, England. He came to the United States in order to pursue his doctorate at the State University of New York, Binghamton, earning his Ph.D. in 1976 and becoming a U.S. Citizen in 1979. In 1976 he moved to Las Cruces, New Mexico, to teach at New Mexico State University, where he met and fell in love with a fellow new faculty member, Jennifer Anne Montgomery. They were married in El Paso, Texas, on January 6, 1980. Soon afterward, they moved together to South Bend, Indiana, where Joseph would serve on the faculty as a professor of English until his retirement in 2017. Joseph published numerous articles, essays, and books on topics ranging from the aesthetics of James Joyce to the development of civil society. He became a globally recognized authority on the Italian thinker Antonio Gramsci, and published three volumes of extensively annotated translations of Gramsci’s Prison Notebooks. 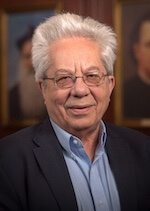 At Notre Dame, Joseph held many leadership and administrative roles, including as Chair of the Department of English, director of the London program, and director of the Hesburgh-Yusko Scholars program, where he mentored some of the college’s most promising undergraduate students, with an emphasis on service and leadership. He relished the company of his colleagues and students, and took great pleasure in the subsequent achievements of the countless women and men who studied under his guidance. All who knew Joe will remember him as a brilliant and energetic man, passionate about ideas, education, public affairs, art in all its forms, and justice. His wife, Anne Montgomery, son, Peter Buttigieg, and son-in-law, Chasten Glezman Buttigieg, all of South Bend, remember him as a loving father and husband who was fond of sports and travel, friendship and family. He was a genial companion, an enthusiastic listener, and a loyal friend, husband, brother, father, and son. Kaniewski Funeral Homes, South Bend, is handling the arrangements. A visitation will be held Friday February 1, 2019 from 4 to 7 p.m. at the Morris Inn on the campus of the University of Notre Dame. A memorial service will be planned for later in the spring. Donations in his memory may be made to the South Bend Community Foundation. To send online condolences, please visit www.kaniewski.com.